Richard Tait is the proud father of a married son enduring graduate school at ASU, and a beautiful YSA daughter at LDSBC. He has spent 27 of the best years of his life married to the same woman for almost 30 years. Richard writes for his own blog, Mormon Third Eye, where he talks about the Third Eye ... the notorious eye in the back of the head, or the extra view of life that God blesses parents striving to do the right thing with so they can see more of life than the children they chase after. Amazingly, Richard has missed only one weekend post in the past 320+ weeks, a streak that started soon after he was released as Seattle Jon's bishop in Maryland. You can read Richard's other guest posts here. We all know what "turning over in your grave" means; the conjecture that someone who has passed away would strenuously object to an action carried out by someone else, often a loved one, who is still living. I'm certain we all know of situations where the son or daughter of a deceased parent has behaved so reprehensibly that knowledge of the incident and/or its evil impact penetrates the portals of death and disturbs the departed. It nominally refers to only the most heinous of crimes, such as murder, violations of established morality, or speaking ill of one's treasured alma mater. But what does it really mean? Often we don't truly comprehend the reverberating waves of what is said until it impacts us personally and touches our very soul. I had a sincerely satisfying experience just a few weeks ago permitting me to fully appreciate what "turning over in your grave" means. However, quoting the merely mortal words of the completely fictional superhero Captain Underpants, before I tell you that story, I have to tell you this story. The following post-teenage tragedy replays itself literally hundreds of times a year across the Wasatch Range, from the freshly-scrubbed streets of Provo to the smelly smokestacks of North Salt Lake - classic episodes of forbidden love. BYU boy meets UofU girl, or vice-versa, they fall madly in love with each other, and it is not until being blinded by the sparkle of romance that they arrive at the terrible realization that they are "sleeping with the enemy" and intend to marry a representative of their alma mater rival. However, filled with an abundance of love for each other, and a belief in President Kimball's mantra that any man and woman possessing enough selflessness and commitment to covenants can make a marriage work, they resolve to make each other happy despite their cavernous difference on this one aspect of life, and they do. The vicissitudes of life take over - children are born and raised, homes are bought and sold, and BYU-UofU sporting events are won and lost. All during this time the masses of bi-academic BYU-UofU marriages continue to function almost normally and bless the earth with a built-in healthy dose of conjugal conflict and rivalry that provide additional dimensions to the spice of life. Against all odds, these mixed couples usually successfully raise well-adjusted children in a loving, nurturing environment. UofU Craig and BYU Janet met on neutral ground, fell in love, and got themselves married in the temple for eternity. Theirs was a love that would last the challenges of intense inter-school rivalry. They served in church callings, raised kids and neighborhoods, and maintained a marriage, all while not vacating their allegiance to their respective alma maters. The annual BYU-UofU football game parties at their house were legion - the world would stop turning for those four hours on that fall afternoon during intense discussion over the merits and weaknesses of each sides' capabilities to cross the goal line. After a long debilitating illness, treasured Uncle Craig passed away quietly last summer. He was truly an amazing person whose only obvious weakness was … well … his love of everything UofU. (you can read more about him here) All those who loved him struggled to cope with the temporary but real loss of his righteous influence and character. My wife's way of dealing with it was to offer to make a memory quilt for my sister Janet using Craig's shirts - a t-shirt quilt. 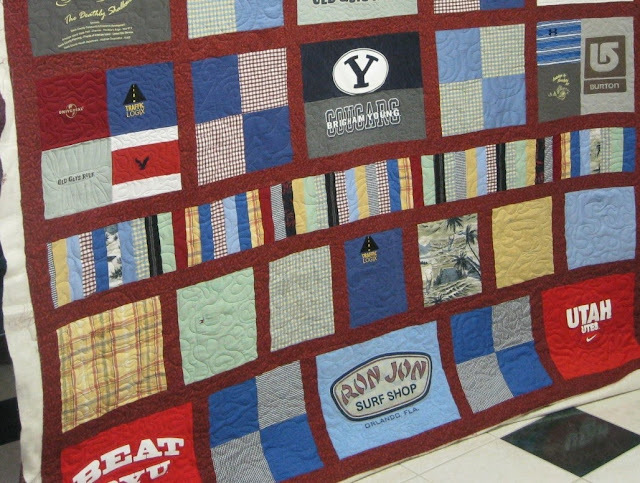 To ensure that the quilt would accurately encapsulate all the marvelous memories that make the man Craig, my wife sought general guidance from Janet on composition and placement before she began. Janet's only input and I quote (according to my memory), "Put the bright red UofU shirts at the bottom, and place BYU shirts right in the middle. Craig has left me now and there is nothing he can do about it." Amazing. 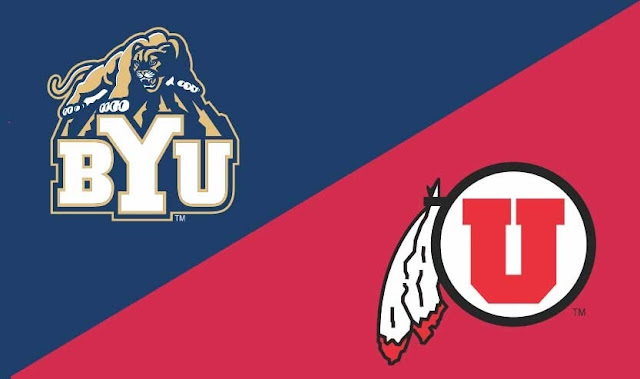 Who knew that the intense BYU-UofU rivalry could extend beyond the grave? Hence, I am certain that at that very moment in time when my wife completed this masterpiece and displayed it to Janet, Craig had to be allegorically "turning over in his grave." This assessment is based on the gospel principle taught by Alma the Younger that when we die, we take our thoughts and desires with us to Spirit Paradise while we await the Resurrection. Death need not separate a wholesome, healthy intra-family rivalry.